Hi, all! Happy Tuesday. I’m popping in quickly on this busy Tuesday to share my card for Penguin Palace! I needed a bright and cheery card and this is what I came up with. I love the Let’s Get Crafty stamps! There are so many sweet ways to use this set to send to your crafty friends. I stamped out a sentiment from the set as well as the little painter and bucket of paint brushes and colored them in with my Copic markers. I also ink blended the edge of a card base with rainbow Distress Oxide inks, and trimmed down my panel with the sentiment so that it was visible when I layered them. Thanks so much for stopping by today! I hope you’re having a great week. I’ll see you again soon with another card! Hi, everyone! Happy Monday. This week is going to be a busy week for me, so I decided to make an encouragement card for today’s Penguin Palace post. Anyone else needing a little encouragement to get through Monday? Let’s jump in! I started the card for today by die cutting two of the Cross Stitched and Dots Large and Small die sets. The larger one I die cut from some light gray card stock and the smaller from some white card stock. I love the detail that these dies add to a card. It’s so sweet. Next I did some creative masking to stamp out the “you are” sentiment from the Get Well Soon stamp set. I love searching other stamp sets to create my own sentiments. To finish the sentiment I die cut some of the Heffy Doodle alphabet dies to spell out “souper” from white card stock. I colored the letters in with my Copic markers for a fun pop of color. Finally, I stamped out the chef from the It’s Your Day and colored him in with my Copics. I used the coordinating dies to cut him out and popped him onto the card with foam tape. And that finished my card for today! I hope you enjoyed this creation, and that it brightened up your Monday a little 🙂 Thanks so much for stopping by today. I’ll see you again soon with another card! Hi, all! It’s Day four of the Penguin Palace release and today we’re sharing the stamp set Congratulations! This is such a perfect sentiment set for all the things you’d congratulate someone on via a handmade card. I used this set in combination with the adorable Welcome, Little One stamp set. They went so perfectly together! This card is cute and simple and so easy to mass produce. Be sure to head over to the Penguin Palace blog and see the rest of the previews of this stamp set from the rest of the team! We’re getting even closer to release day, but there is still lots to show!! Thanks so much for stopping by, and I’ll see you again soon with another card! Happy day three of previews for Penguin Palace’s new release! 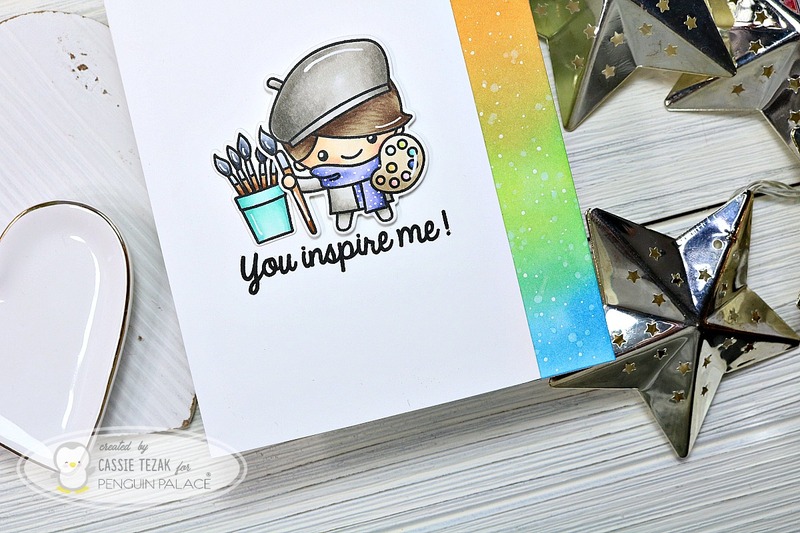 Today I’m sharing my card for the It’s Your Day stamp set. I used some of the adorable people images from this set to create a look as if the recipient is getting the celebrity treatment. My inspiration was the red carpet and I wanted this to look like a movie premier or some exciting party! There are so many fun sentiments in this set, and the people are so cute & go with them perfectly. I loved creating the spot light for this card by doing some easy masking and the confetti was achieved with a panel die. There are so many fun projects you could make with this, and let’s face it-who wouldn’t want to be given celebrity treatment for the day! Thanks so much for stopping by today! Be sure to see all the previews on the Penguin Palace blog! I’ll see you again soon with another card! Penguin Palace Preview Day 2! Hi, everyone! I’m stopping by quick to share my card for day 2 of the previews for Penguin Palace’s new release. 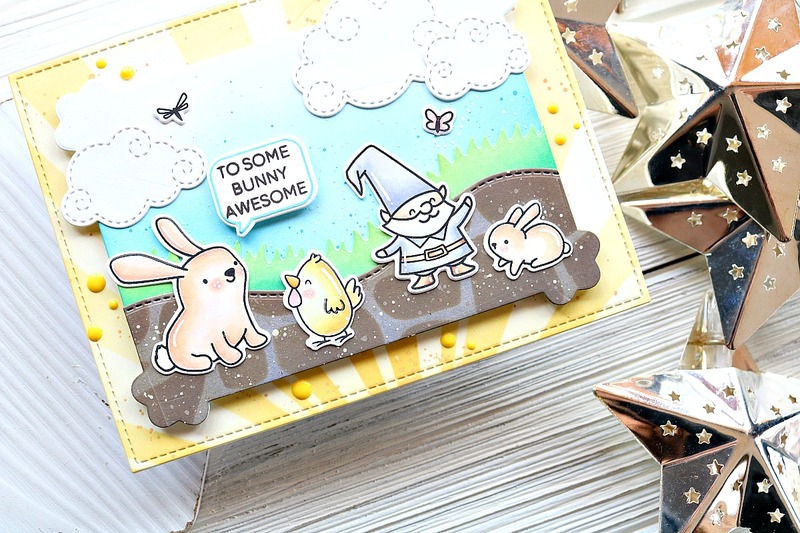 Sharon has all the cards on the Penguin Palace blog, and today we’re sharing our creations featuring the My Best Pal stamp set. This is such a cute stamp set with some cute dogs and lots of unique sentiments. Here’s the card I created. How cute is that pup with the balloons?? 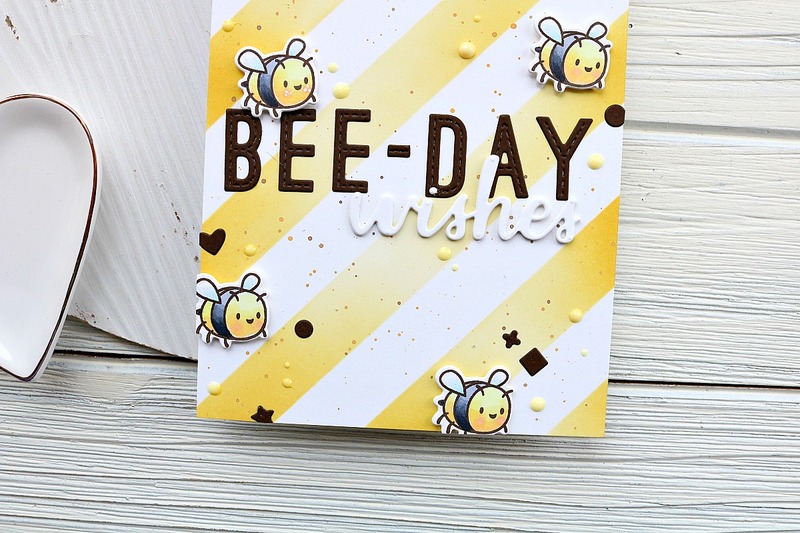 Another favorite from this set is the beautiful ‘happy birthday’ stamp which has a coordinating die to cut it out! Love that! I also think the other images in the set are perfect for scene building, and some could work on their own or with other stamp sets which is always a plus! Check out the Penguin Palace blog for more great projects and keep watching for more previews! Thanks so much for joining me today, and I’ll see you soon with another card! Hi, all! I’m popping in today to share a card I made for the new Penguin Palace release which will be coming March 20th! This release is so fun and I can’t wait to show you all the projects I’ve made for it. Today’s highlighted product is the stamp set “Let’s Get Crafty” and it’s a must have for the artists in your life! Here’s a look at my card. I just love all the cute images in this set, and the sentiments are so great for all the crafty people in your life. I created this card by doing some ink blending and lots of Copic coloring and die cutting. I loved creating this little painter’s scene. I was drawn to the “you inspire me” sentiment, and know several people I’d love to send this card to. Be sure to head over to the Penguin Palace blog and see what the rest of the design team created for this preview! The release is just around the corner and we have lots to share with you! Hi, everyone! I hope you all had a lovely weekend. I’m back today with another card for Penguin Palace. I guess I’m on a bit of a mermaid kick, because last week I made a mermaid card, and I made another one for this week! Let’s take a look. Today’s card is a pretty easy design that utilizes the masking technique for a fun little scene. I started the card by stamping the shopping bag image from the Let’s Catch Up stamp set. I created a mask and continued to stamp it along the bottom to look like mounds of shopping bags and boxes. The trick to make it not look like the same exact image over and over again is to turn the stamp set to the left or right, or move it up or down when stamping the next image. That way you have a variation and the heap looks more natural. I colored them all in with my Copic markers. Next I ink blended some blue ink over the rest of the card panel so that it looked like water. I used a blender brush and faded the ink towards the bottom. I didn’t bother masking all of the bags, instead I was just careful not to go over them and got as close as I could to them. I don’t think you really notice that it isn’t perfectly blended up to the image lines! It saved me some time! I stamped the cute shopping mermaid from the set as well and colored her in with Copics. I fussy cut the image out and adhered it to the card with foam tape for some dimension. Then I stamped and heat embossed my sentiment from the Take A Break stamp set onto white card stock. That was also adhered with foam tape. The final touch was to add some white gel pen details. Most of the bags and boxes got polka dots or stripes on them, and the mermaid got some high light lines. I always love adding this detail, because it does so much to give interest to the scene! That’s my card for today. I hope you enjoyed it!! Thanks so much for stopping by, and I’ll see you again soon with another card! Hi, everyone! Happy Monday. I can’t believe it’s the start of another week. Where does the time go?? 🙂 Today I’m sharing a card I made with some cute Penguin Palace stamps. There are such cute unicorn sets from Penguin Palace, and they are hard to resist! On a card base I ink blended some Mermaid Lagoon ink to create a sky. I decided that my unicorns needed some grass to be walking in, so I die cut a piece of paper with a grass die and ink blended some green inks over it. This time I did get messy, and splatter some of the darker green ink (that I had mixed with a little water) and some white paint over the grass die cut piece. I thought this added some interest and fun texture. I put the pieces together so that my scene was all ready for the little unicorns. I stamped out the Unicorns from the An Amazing Friend stamp set and colored them in with my Copic markers. Then I die cut them with the coordinating die. The space between the unicorns and the cake I cut out with a craft knife so that more of the background would show through. White high lights and details were added to the image with a white gel pen and then they were adhered with some foam tape. Hi there, everyone! Welcome back to my blog. Today I’m back to share a card I made for Penguin Palace that is quick and simple! Sometimes you’re just in a hurry and I have some go-to techniques that look great, but are really quick. To start out, I ink blended a background with Dried Marigold and Worn Lipstick Distress Oxide ink. These blend so beautiful. It’s still a work out on your arm, but it goes pretty quick! And you can customize what colors you’ll end up with because of the large variety of Distress Oxide colors. I splattered some white paint on the background to give it a little interest, but that too was simple! Next I took the Hedgehogs In Love stamp set from Penguin Palace and stamped out the two cute hedgehogs you see. I picked them because I thought they looked like a cute little couple. I stamped them with my Copic friendly ink, and colored them in with some very simple Copic color combos. There isn’t much to these little critters, so coloring took no time at all! I made sure to try to match their accessories to the background to make it look more planned out and cohesive. They were die cut and set aside to be attached later. For the panel they’re sitting on, I trimmed down a piece of white 110 lb cardstock and used a stitched die on the top and bottom to add some nice detail. The addition of this took only minutes, but added such a fun element to the card! Then I stamped the sentiment on the lower left side and adhered the hedgehogs. The strip was attached to my background, which was attached to a card panel and this card was done! Like I said, quick and simple! I hope you enjoyed the card for today. If you think these hedgehogs are as cute as I do, be sure to check them out in the Penguin Palace shop! Thanks so much for stopping by today. Have a great day, and I’ll see you again soon with another card!